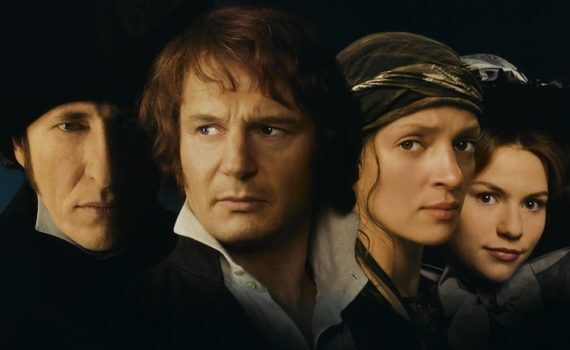 I am now as much of a Les Mis expert as I can be without becoming a scholar on the subject, having seen the play, read the book, memorized the soundtrack, and watched both film versions. I don’t think many people can claim the same, especially reading the unabridged novel, so I’m an elite Les Mis fan, bully for me. I do love the story, it is an amazing tale, and I’m so glad there are people who feel the way I do and who are so much more talented then me, so that it can come alive in ways I could never dream of producing. But I have to say, I’m a little disappointed in the 90s dramatic take on the classic; it does not do Hugo’s work justice, and it pales in comparison to the stage play as well, leaving audiences wishing they had consumed this magic in a more magical way. The film begins as a period piece on par with Jane Eyre or the like, a costume drama with wonderfully magnified characters and melodramatic problems. It doesn’t take the musical route, which is fine, instead focusing on the book and the attempt to bring it to life. For the first hour or so, I was enthralled, I was transported back in time, I was eager to see how this movie would tell this phenomenal story. But the second half brought only disappointment, and I think there are multiple culprits to blame. First, this director isn’t good at all, and he fails to bring the right elements to life, relying far too heavily on the movie to miraculously make itself in the book’s image. Second, Claire Danes is god-awful as Cosette, and really brings down the third act. A combination of bad direction and bad acting is almost insurmountable, Neeson & Rush teaming up to save the day, but just barely. This is a strange delivery, an unnecessary version, a missed opportunity, and yet I still love the source material so much I can’t completely warn you away.